I have a recurrent budget of $0 to update our traditional, suburban 1980s two-story house. That means it went several years without quartz counter tops and will continue to go several more without quartz counter tops. Built in the mid-80s, every counter in the house has this fake wood edge. Don’t even whisper, “Oh I don’t know, it’s kind of different,” because you’re wrong. Especially wrong after I painted our cupboards from their builder’s grade oak to something slightly more current. Ew. The true counter surface wasn’t that bad and if I had the guts and know-how I would have attacked just the edges and considered just removing the back splash. Blinded by my obscene desire to just get rid of all of it, I started taping without consulting others in the house. Starting this project meant shutting down the most-used room of the house for an indefinite period of time. For instance, this little sliver is where we keep the coffee pot. It was my test point. If this didn’t work, the rest would stay. As with anything shiny, sand it first. I just did a quick 110-grit power sander once-over to the entire area. Figured my primer was the sticking point. I used to work in a paint store and got to know the good and the bad between brands. Always always always buy Gripper Primer by Glidden. That sh!t sticks to anything. Side note: the above photo shows how using a brush left streaks. Bad move. Use a roller. Paint and sealer don’t actually fill in those stripes. Look how nice the primer looks using a roller! Lesson learned. 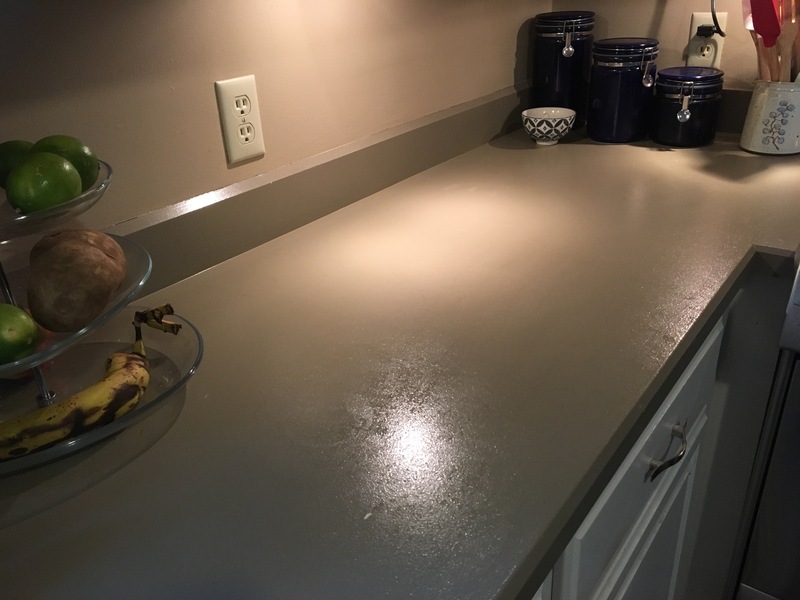 I have a color palette for the whole house and the darkest color is what I decided to put on the counters, for a drastic complement to the white cupboards and (eventual) tan walls. I used Behr Ottertail in flat finish. I didn’t need the shine since my seal coat would have it. Below is after one coat – you can see roller marks and the primer popping through. The one thing I was most displeased with was how I could still see roller marks. I used the smoothest, shortest nap roller, I used the foam rollers designated for high gloss, I dragged the foam roller across the counter without it rolling. Nothing got rid of these marks. I never truly got rid of the streaks. I did, however, get rid of the faux wood which was the ultimate goal. Tune in next time for my own review of painting a kitchen counter, what it’s like one year later, and what I’d do differently.